Let the forest whisper your love! Reveal how you feel to that someone special with this love saying or your own thoughts in the carved heart. 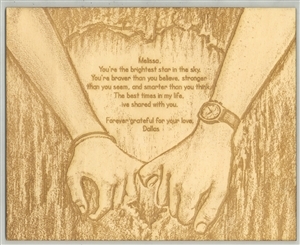 Based on our most popular Art My Way pencil sketched True Love, we bring you this unique engraved wood art! It is carved with the latest laser engraving technology on premium tilia wood and ready to hang. This beautiful piece of art will surely become the perfect gift for wedding, anniversary and Valentine's Day celebration.